Birders Vista Bed and Breakfast Our records show that this inn is closed. Mission Inn Our records show that this inn is closed. Alta Vista Bed & Breakfast Inn Our records show that this inn is closed. 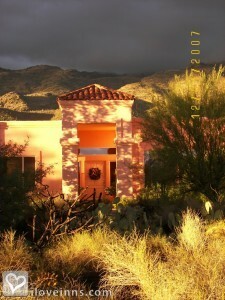 Sierra Vista bed and breakfast travel guide for romantic, historic and adventure b&b's. Browse through the iLoveInns.com database of Sierra Vista, Arizona bed and breakfasts and country inns to find detailed listings that include room rates, special deals and area activities. You can click on the 'check rates and availability' button to contact the innkeeper. Birders Vista is a quiet retreat at 4600-feet elevation with beautiful views of the Huachuca and Mule mountains. Hummingbirds are here all year round. Enjoy the great weather while visiting Tombstone, Bisbee or the wineries in Elgin in southeastern part of Arizona. The city of Sierra Vista is in Cochise County, Arizona. Being close to the Mexican border, Sierra Vista bed and breakfast inns are often filled with guests en route to Mexico. Sierra Vista has several interesting places which makes it a destination. About eight miles away from the city is Ramsey Canyon Preserve, which is a great place to relax or to take up the challenge of nature through hiking. Visitors who like to catch a glimpse of beautiful hummingbirds can visit Beatty's Miller Canyon Apiary and Orchard. For watching more variety of birds though, Garden Canyon should be part of the itinerary. More than two miles away from the center of Sierra Vista is Fort Huachuca Museum, which displays the history of the United States Army. Dining is also a good experience in Sierra Vista with restaurants like The German Caf� and Mesquite Tree Restaurant. Sierra Vista, or in Spanish "Mountain View", is roughly 70 miles southeast of Tucson and it has been for the most part of the existence of this city, served as the cultural and commercial hub of the Cochise County which is where it is located. Cochise County is in the state of Arizona and Sierra Vista is where Fort Huachuca is situated. Sierra Vista is living up to its name because of the majestic mountains that surround this wonderful city -- Mule Mountains, Mustang Mountains, Whetstone Mountains, Dragoon Mountains, and the Huachuca Mountains, and on the east, the many water fun opportunities that this city offers is provided by the San Pedro River. We invite you to stay at any of the Sierra Vista bed and breakfast inns and ask directions in the morning on how to get to the Ramsey Canyon Preserve and watch the different bird species that either nest or pass by during migration.